Ever wonder why Aristotle A. Avinroo claims to be the best gamer in all of Neopia? Perhaps you have contemplated what gives him the right to shorten his name and demand that all of his competitors refer to him by a three letter acronym? Or maybe you have just wondered why Dr. Frank Sloth or Lord Kass have never bothered to capture him? To quench your curiosity, this article will nonchalantly discuss the top ten reasons why Neopians should grovel and worship AAA. 1) Aristotle A. Avinroo sports a trendy headset that relies on primary colors to shield his shifty eyes from his opponents. While Spectre and Princess Fernypoo may be masterminds at depicting the meaning behind subtle eye movements, long gazes and the fluttering of eyelashes, especially when it comes to Cheat, their skills of interpretation are useless against the Master of the Games Room because they cannot anticipate this Blumaroo's sneak attacks. Without being able to discern what part of the computer screen AAA is concentrating on, they find it impossible to predict his actions. Spectre once even had the bright (or not so bright) idea of trying to knock Aristotle's headset off his face. Little did this red Jetsam know that his adversary's headset is permanently attached to the bridge of his nose with Meerca Brothers Glue. The bandages themselves also do more than just hold the dichotomous faerie-colored lenses together. Since Aristotle's state-of-the-art frame stores up to 50,000 volts of electricity, poor Spectre never had a chance; he was zapped with enough electrical currents to power the Virtupets Space Station for an entire year! 2) Regardless of how deceptive and powerful the headset might be, it cannot conceal the size of Avinroo's cranium. Supposedly, this brainiac's intelligence quotient is so beyond average that even The Neopets Team has yet to figure it out - though I suspect that Squiggles might have coaxed it out of Aristotle in exchange for a makeover and some fancy new duds including a jacket, shirt, trousers, shoes and even a cane with a little bit of "extra flair." AAA may be many things, but unfashionable is not one of them. 3) Having escaped the clutches of King Roothless and his guards in Dungeon Dash, it is safe to say that this Blumaroo's speed is almost as formidable as his IQ. Unsurprisingly, all of the 'training' he received while dodging falling blocks of ice, potholes, boulders, ice cream and pirates definitely had a significant impact on Aristotle's quadriceps and calf muscles. Not only can he outrun his nemeses in computer games, but his lightning fast reflexes would make him a strong contender in the Poogle Races. 4) Who needs running though when Aristotle A. Avinroo has a hovering chair equipped with Kreludorian anti-gravity technology and Moltaran steam-powered booster cells? Not even Queen Fyora's royal throne is comparable to this beauty. Its multitasking capabilities are unprecedented. This one-of-a-kind contraption can help plan the destruction of Neopia's moon in The Return of the Return of Dr. Sloth while, simultaneously, providing snacks, refreshments and massages. It is even rumored to have a mind of its own. For this reason, "Neopets who easily get dizzy shouldn't ride." It takes a determined will and a strong stomach to withstand its sudden movements and abrupt stops. No wonder Abigail and Lulu hide under the covers whenever it floats soundlessly down the hall of their Neohome at three or four in the morning. Those who are fainthearted should heed my warning and be wary of both the chair and its owner! 5) Aristotle's secret weapon may easily be overlooked, but at great consequence. While his modernized glasses, mental caliber, swiftness and his cutting edge chair are handy tools within his possession, they are nothing compared to his little sister, Abigail. Though she may not excel at computer games per se, she has her older brother's back and she is a gifted tattler. Once she caught Master Vex sneak some game pieces from inside his sleeve onto the board and she quickly informed the keepers of the Darigan Citadel dungeons of this dishonest prisoner's violation of the international Cellblock rules and regulations. Imagine what she would do to ensure the integrity of a competition that her older brother intended to win? This untamed firecracker goes unnoticed, but she is just as mischievously resourceful as Aristotle himself. It runs in the family. 6) With that said, however, Team Brains (governed by AAA) was victorious against Team Brawn (led by Abigail) during the Games Master Challenge of 2011, which would not have been possible without this Blumaroo's loyal supporters who attempted to send in scores for 60 different qualifying games, among other menial and time consuming tasks. Crazed and totally obsessed teenagers, including but not limited to Royal Girl Kacheeks, Kyrii and Pteris, similarly demonstrated their extreme admiration for AAA by redecorating their bedrooms and plastering their closet doors with posters of their beloved idol - some of whom have yet to take down their GMC decorations and memorabilia. Remember that if you mess with the Master of the Games Room, you also mess with his fans! 7) Ambidextrousness is another characteristic that should instill fear in Avinroo's competitors. While most Neopians are uncomfortable with using their non-dominant hand, this talented Blumaroo can increase his chances of winning by using all ten fingers synchronously. He has been spotted throwing Gormballs to Thyassa the Chia and Kevin the Korbat in addition to splatting a Sloth at the same time. 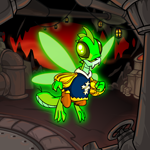 Few Neopets stand a chance against this impressively coordinated player. 8) Supplementing his already high level of competence when it comes to balance, body positioning and coordination, Aristotle's elongated ears grant him an additional advantage during Round Table Poker tournaments and one on one combat with his cousin, Lulu, for repeatedly messing up his room. Not only can he differentiate between sound frequencies, but supposedly his unique anatomy and physiology enable him to identify those wavelengths that are typically reserved for and processed by Doglefoxes and Biyakos. These supernatural auditory senses enable Avinroo to react quicker to oncoming obstacles and with greater accuracy in targeting unfavorable opponents. Be careful when approaching this Blumaroo because some suspect that he can even 'hear' and decode your most private thoughts and secrets while in close proximity! 9) His superior elitism is further illustrated by his youth - not many have accomplished as much as AAA by the age of fourteen. Of course, this cunning adolescent could have found a way to manipulate the Neopedia gatekeeper from permitting anyone to update his entry. 10) Last but not least, it has been whispered amongst the ladies of Princess Amira's court that those who have encountered Aristotle A. Avinroo on the playing field can attest that, if and when he removes his headset, this Blumaroo's bone-chilling stare is colder and more petrifying than the Snowager's glare. It has even been rumored that he can immobilize potential thieves, cunning rivals and quite possibly a Shadow Wraith with the slightest raise of his eyebrows and the smallest almost unnoticeable dilation of his pupils. This gossip about AAA's icy disposition has spread across the many lands of Neopia, starting in Qasala and traveling as far as the underwater caverns and crevices found only in Maraqua. The order of the information listed above is irrelevant because it is the combination of these dissimilar yet interrelated traits that characterizes the persona of Aristotle A. Avinroo which, correspondingly, makes him a force to be reckoned with. Thus, it is of the utmost importance to take this newfound knowledge and utilize it to mentally and physically prepare for your next encounter with this detestable yet lovable brainiac. Daily Dare is here! Tomos was getting irritated quickly. "Once a Scarab, always a Scarab. Don't talk about her like she's some sort of traitor."